This front walk had two 6 inch steps that needed wheelchair ramps to improve handicap accessibility. This job is trickier then it at first appears. Measurements must be precise and the ramp’s leading edge must be tapered to avoid tripping points. Extra time needs to be allotted for planning. 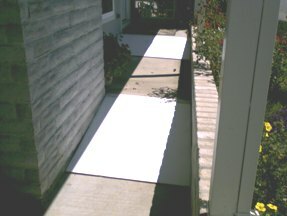 Using exterior grade plywood and 2×6 support joists these ramps were secured to the walkway with concrete screws. They were then primed and painted. The weather was hot and dry so the entire job was completed in a single trip. $300 may be a fair price for what is there but the ramps, while meeting customer expectations, may pose some serious liability. The problem is that the ramp is intended to be a wheelchair ramp which brings in the issue of ADA compliance. For starters, the ramps are probably too steep, have no non-skid surface, have no hand rails, and the landing at the front door isn’t large enough. It would take a lot of work to make this entrance ADA compliant. I love doing work for people with special physical needs but it is an area that requires knowledge of ADA compliance, insurance liability, and especially an eye for your customer’s safety. A safe and ADA compliant ramp in this setting could easily be $1000 or more. I would agree with “Trace” ADA compliance Is the type of work that your are absolutely required to stand behind, and in doing so, it opens you to a large amount of liabilty, especially in my area. I live in an area with a fairly high cost of living. $1000 would at the low end of the specrum. The mean would probably be right around $1350 to make sure your are in compliance with the landing and railings and the proper slope. I work mainly in Bucks County, PA, and the surrounding area. I agree with both Mike and Trace. I currently build wheelchair ramps for the VA, for disabled veterans. While the job is very rewarding in many ways, an ADA compliant ramp has more specification than one might think. An acceptable wheelchair ramp would never be made of plywood of any grade. Also, as mentioned, must be modified to include a level 5×5 landing pad at door. Resting pad every 30′. Continuous handrail @ 32″ – 38″. No more than 4.8% grade. A good rule of thumb for pricing an adequate, ADA compliant wheelchair ramp will be around $90 per linear foot. Sadly, mobility solutions are expensive. Stairlift = $20k; PowerChair = $5k; Vehicle Carrier for PowerChair = $4k; Average size wheel chair ramp (20 ft) = $2000. I’ve looked at a few different type jobs on this site just to see what this site is all about. I don’t know what the admins are smokin’ but the numbers on this site are incredibly unrealistic, not even close- not unless you want to live in a trailer down by the river. The more accurate numbers are down in the comments from guys that do this day in day out. I just estimated a 20′ ADA ramp and it came in at $2010.00.